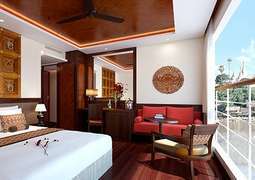 The all-suite Avalon Myanmar was meticulously designed to offer the best cruise experience on the Irrawaddy River. Launched in 2015 and carrying only 36 guests the ship offers an unrivaled small-ship cruise experience. Each stateroom features a wide, wall-to-wall, panoramic window, which opens to create an indoor-outdoor living space. All cabins have large bathrooms, spacious storage space and the line's "Comfort Collection" beds. The spacious open-seating restaurant features a delicious selection of local cuisine and familiar western favorites. Complimentary tea, coffee, soft drinks and local beers and spirits are included in the price of the cruise. Onboard amenities include an open-air observation lounge with shade and premium lounge chairs, air-conditioned indoor lounge, bar, spa treatment room, fitness area, library and games.